Is Jokowi shifting the trajectory? Indonesia has much economic potential but the trade-off between growth and stability continues to bind its growth ambitions. Indonesian economic policy continues to prioritise stability over growth but the adequacy of economic growth has become the bigger issue. President Joko Widodo’s commendable pro-growth efforts have so far only stabilised Indonesia’s trajectory rather than boost it. Doing better will require reforms to be calibrated to make the trade-off between growth and stability less binding while enhancing productivity. Views of the Indonesian economy oscillate between optimism that it is set to become the world’s next economic giant and fear of renewed instability. Such views, however, get the story backwards. Indonesian policymakers have consistently prioritised stability over growth. The more concerning issue is that the economy is now heading into its fifth consecutive year of subdued growth. Although growth is solid at about 5 per cent a year, it is inadequate in terms of the job creation and economic modernisation required to meet Indonesia’s development needs and ambitions. The problems are structural. Indonesia is hemmed in by the need to protect stability while its growth model has struggled to deliver the productivity gains necessary to grow faster within this constraint. Left unaddressed, even the ‘new normal’ of slower growth will not last. Understanding why growth has been stuck and what needs to be done are the critical economic issues facing Indonesia today. The global economic environment is set to become more difficult, with liquidity conditions tightening and risks of escalating protectionism. Meanwhile, Jokowi is beginning his bid for re-election in 2019. His focus on infrastructure, fiscal reform, and improving the business climate are broadly what the economy needs to stimulate growth. Jokowi’s programs have made progress. Yet the economy has been largely unresponsive. Will more of the same eventually deliver the faster economic growth Indonesia seeks? Or is something else needed? This Analysis reviews Indonesia’s recent economic performance and sets out why the present growth path is inadequate. It analyses structural problems with the current growth model and assesses to what extent Jokowi’s policy efforts have improved Indonesia’s growth trajectory. It also outlines the policies needed to realise faster growth while preserving stability. Over the past decade, Indonesia has been a consistent performer in an otherwise weak and volatile global economy. Growth has averaged 5.5 per cent a year since 2003 and the economy has proven remarkably resilient, withstanding numerous shocks including the global financial crisis of 2008–09, the end of the China-fuelled commodity boom around late 2011, and acute market pressures during the ‘taper tantrum’ of May 2013. Growth has, however, remained stubbornly low at about 5 per cent since 2014, down from more than 6 per cent previously (Figure 1). This slowdown in growth can be traced to the end of the commodity boom, which has weighed on Indonesia’s key exports (including coal, palm oil, base metals, natural gas, crude oil, and rubber) while indirectly affecting investment and government spending. Initially, some analysts saw the slowdown as temporary, being either a cyclical phenomenon or otherwise easily corrected by minor policy tweaks. Such views have proven misplaced and expectations of a rapid shift towards manufacturing-led growth have been largely disappointed. Figure 1: A new normal of slower economic growth? Meanwhile, economic policy has continued to prioritise stability over growth. Despite years of abundant global liquidity, government policy has been geared towards limiting external borrowing and keeping the current account deficit in check. The lead-up to the 2013 ‘taper tantrum’ was a brief exception, with the current account deficit reaching above the 3 per cent of GDP warning level before market volatility and capital outflows eventually forced a correction. Since then, Indonesia has hewed closely to its ‘stability first’ mantra — the current account deficit has been reduced, external borrowing capped, and foreign exchange reserves kept well above standard adequacy metrics (Figure 2). Combined with a well-capitalised banking system and conservative fiscal and monetary policies, which have kept government debt low at 29 per cent of GDP and inflation within the central bank’s target range, the result today is that Indonesia’s stability fundamentals are well anchored. The cost of protecting stability, however, has been to forgo riskier pathways to sustaining rapid growth. Note: Reserve adequacy in Panel A is the ratio of foreign exchange reserves to gross external financing requirements (defined as the current account deficit plus external debt maturing within one year). A ratio above 1 is considered adequate. 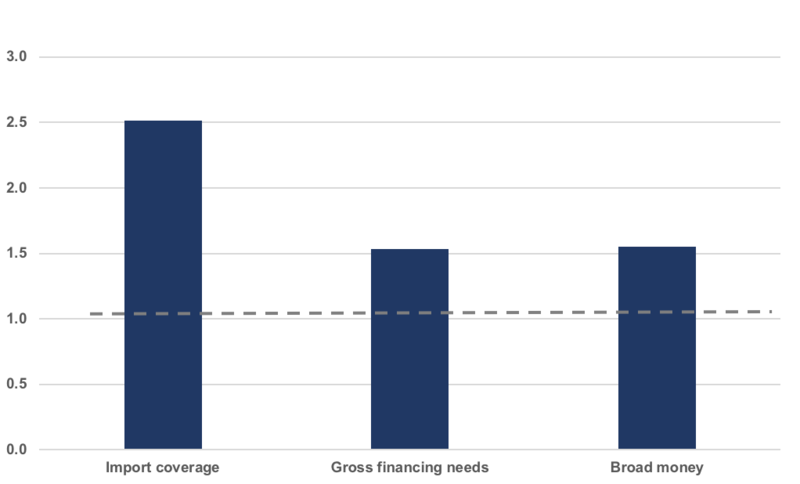 In Panel B, reserve adequacy is considered adequate if the ratio is above three months of imports (guarding against import financing risks), one year of gross external financing needs (guarding against external financing risks), and 20 per cent of broad money (guarding against domestic capital flight risks). This trade-off has returned to focus in 2018, with Indonesian financial markets again caught up in generalised capital outflows from emerging economies as US interest rates rise and the US dollar strengthens. Volatility is likely to persist as US monetary policy continues to normalise, especially given the outsized role of foreign investors in Indonesia’s financial markets. There are also fears contagion might spread from more troubled markets such as Turkey and Argentina. Nonetheless, strong stability fundamentals mean Indonesia is well placed to manage, barring a far more serious dislocation in global markets. Bank Indonesia has also acted decisively to shore up stability. After intervening early in 2018 to support the rupiah, by mid-year it had switched to tightening policy — hiking interest rates by 100 basis points and sending a clear signal that it intends to keep Indonesia firmly in the safety zone between growth and stability. These latest developments reinforce that Indonesia faces a ‘new normal’ of slower growth. While growth at about 5 per cent a year is solid by international comparison, it is inadequate for meeting Indonesia’s development needs and ambitions. 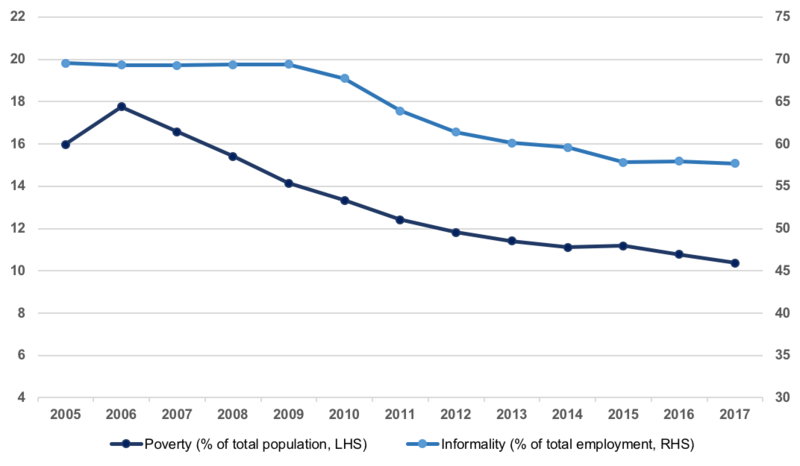 In the most basic sense, this trajectory will not be enough to end widespread economic vulnerability, even by 2030: on current trends, poverty will persist and about half of Indonesian workers will still work in insecure informal sector jobs. As Figure 3 shows, the economic slowdown since the commodity boom has been accompanied by much slower progress in reducing poverty and informal employment, reflecting Indonesia’s need for faster growth in order to productively absorb its expanding working-age population. Note: Informality is measured using the ‘crude’ or proxy 2 definition, which includes self-employed workers without permanent paid employees, casual workers, and unpaid family workers. In a more ambitious sense, the current growth trajectory will not be enough to transform Indonesia into a true global economic power by 2030. Despite Indonesia’s membership in the G20 and pockets of rising sophistication such as in e-commerce, in most other ways its standing in global league tables is closer to that of Malaysia or Thailand than commensurate with Indonesia’s much larger economic size. For example, Indonesia has fewer top global firms than either country; its total overseas direct investment holdings are half that of Malaysia and two-thirds that of Thailand; the market capitalisation of its stock market is only marginally larger than either country; its high-tech exports are considerably smaller; and it registers fewer international patents and trademarks each year. Not one Indonesian university currently ranks in the top 800 in the world. In terms of translating economic heft into global economic stature, Indonesia has a long way to go and is starting from behind. For Jokowi, boosting economic growth has been a central policy priority. On taking office in late 2014 he inherited an economy under pressure. Growth was slowing, a large current account deficit had opened up, and the fiscal deficit was rapidly approaching the legal limit. Decisive early action to cut wasteful fuel subsidies successfully arrested this situation. Jokowi then launched an ambitious pro-growth agenda focused on large-scale infrastructure development, fiscal reform, and dramatically improving the business climate. Progress has been made by several objective standards. A number of high-profile infrastructure projects are being completed, particularly in and around Jakarta. 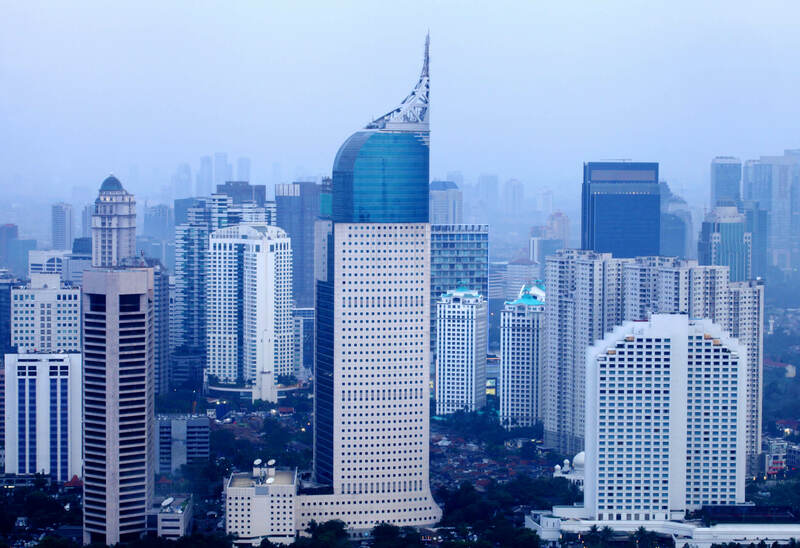 Subsidy reform and more credible budgeting have seen Indonesia’s sovereign credit rating lifted to investment grade, or higher, by all of the major credit rating agencies, a status last enjoyed before the Asian financial crisis. Efforts aimed at cutting red tape also appear to have been successful, with Indonesia ranking 72 out of 190 in the World Bank’s Ease of Doing Business survey in 2017, jumping 42 places in just three years and putting it among the world’s top reformers by this measure. A largely unresponsive economy has therefore prompted many, including Jokowi, to ask deeper questions about the reasons behind Indonesia’s sluggish growth. Cyclical factors have certainly played a role. However, deeper structural problems are also holding the economy back. Investment growth has been notably weaker since the end of the commodity boom. Even so, Indonesia’s problem is not that investment has been too low. In fact, it has remained at a higher level than during the commodity boom, hovering at about 32 per cent of GDP compared to 25 per cent on average over 2003–2011. The problem, rather, is that elevated investment is now translating into less economic growth. This is illustrated by the incremental capital-output ratio (ICOR), which measures how much investment is needed to generate a given amount of economic growth. 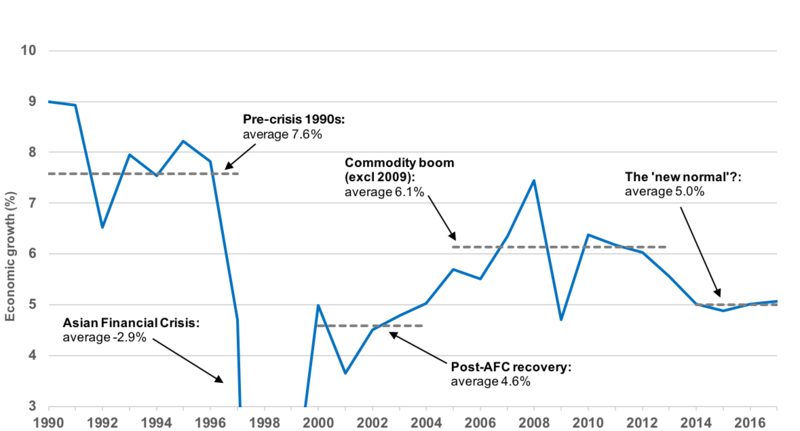 As Figure 4 shows, the ICOR has risen dramatically since 2007, indicating deteriorating efficiency. Cyclical factors are one possible explanation for Indonesia’s diminishing returns on investment, particularly as the ICOR tends to worsen with economic slowdowns. A shift away from commodity-based activity since 2011 may also have rendered Indonesia’s existing capital stock less productive. However, the trend deterioration in investment efficiency predates the current economic slowdown and has been persistent, meaning cyclical factors cannot be the primary explanation. Structural explanations seem more relevant. Investment quality appears low in several important ways. For example, the vast majority of investment goes towards constructing buildings rather than public infrastructure or machinery and equipment, where the returns are likely to be higher. Foreign direct investment (FDI) accounts for a small share of total investment, averaging 2 per cent of GDP over the past decade and lower than most Asian peers, including Vietnam with 6.6 per cent of GDP, Malaysia with 3.5 per cent, and Thailand with 2.5 per cent. As FDI generally leads to strong productivity gains, including positive spillovers for other parts of the economy, this detracts from overall investment efficiency. Also, very little investment is intermediated by the financial system. Instead, most investment is funded out of firms’ retained earnings and is therefore less likely to be directed towards the most productive potential uses. Moreover, economic growth in Indonesia has been heavily capital-intensive, pointing to risks that diminishing returns will persist or even worsen. As Figure 5 shows, economic growth in Indonesia has been more capital-intensive than elsewhere in the region. From 2003 to 2015, capital deepening accounted for 73 per cent of Indonesian labour productivity growth compared to 29 per cent in Philippines, 51 per cent in Thailand, and 66 per cent in China, where very high investment has nonetheless been accompanied by solid productivity growth. Indonesia’s problem is therefore not its level of investment, but rather inadequate productivity growth. A key source of productivity growth in developing economies is moving workers from traditional agriculture to more modern sectors of the economy where labour productivity (valued-added per worker) is higher and grows faster. Indonesia experienced manufacturing-led growth during the mid-1980s through to the mid-1990s. Since then, however, it has undergone a low-quality structural transformation. Agriculture has continued to shed surplus workers but around two-thirds have moved into low-end services jobs such as drivers and domestic helpers rather than into more modern sectors of the economy (Figure 6). Note: Bubble size represents the share of the workforce in each sector following the nine industry classifications used by the Indonesian Central Statistics Agency. The two sectors labelled low-end services are: personal, public and social services; and trade, restaurants, and accommodation services. Modern sectors include: mining and quarrying; industry; electricity, water and gas; construction; transportation, warehousing and communication; and finance, real estate, rental business, and company services. Relative labour productivity is calculated as the ratio of value-added per worker in each respective sector to the non-agriculture average in 2017. This creates two problems. First, this shift only provides a small boost to output because low-end services jobs are only slightly more productive than agriculture. More problematic is that it creates a legacy effect, which can depress future growth as a larger share of workers are now in a relatively stagnant part of the economy. 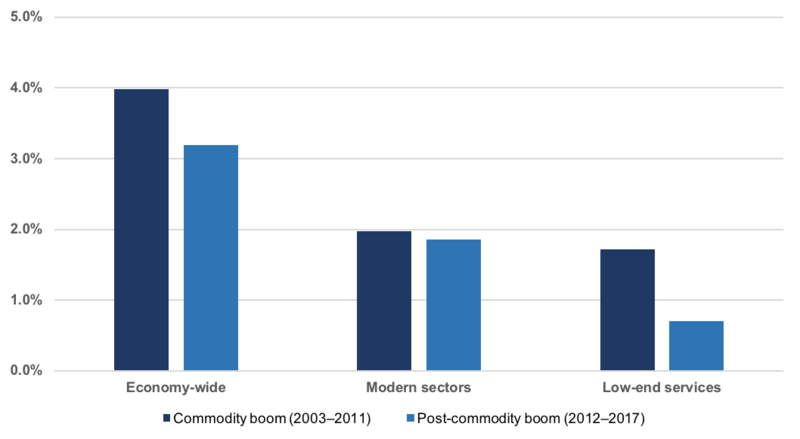 The pattern of low-quality structural change has worsened since the end of the commodity boom. As Panel A in Figure 7 shows, economic growth has become more reliant on an expanding workforce while the contribution of structural change has shrunk dramatically as employment gains in higher productivity sectors (notably mining, manufacturing, and modern business services) have slowed. 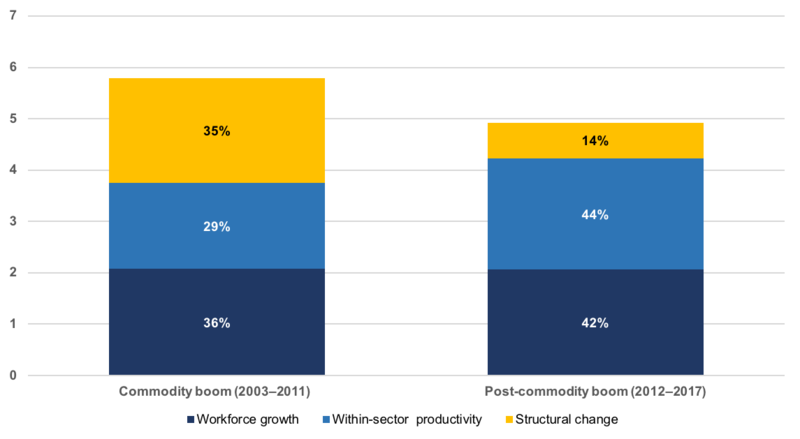 This has been partially offset by a larger contribution from ‘within sector’ productivity gains, reflecting a higher share of workers in more modern parts of the economy by the end of the commodity boom. Labour productivity growth has nonetheless decelerated sharply (Figure 7, Panel B). The performance of Indonesia’s modern sectors has held up, although it remains modest at around 2 per cent a year. However, productivity in low-end services — where around 40 per cent of workers are located — has stagnated. In effect, Indonesia’s modern sectors are not generating enough jobs to adequately absorb its rapidly expanding and urbanising workforce. As a result, the low-end services segment acts as the default sector of employment. The problem is this creates a surplus labour type situation, where additional influxes of workers only weighs on productivity growth even further. Source: Author’s calculations based on Indonesian national labour force survey and national accounts data. The growth decomposition in Panel A is calculated following a similar methodology to the Shapley decomposition approach used by the World Bank: http://siteresources.worldbank.org/INTEMPSHAGRO/Resources/JoGGs_Decomposition_Tool_UsersGuide.pdf. Indonesia’s growth model is running into problems. Capital-intensive growth is giving way to diminishing returns while the benefits of an expanding workforce are faltering as more workers find themselves stuck in low-productivity jobs. The problems are not yet acute. If left unaddressed, however, the ‘new normal’ of slower growth will not last and growth will inevitably slow further. The Jokowi administration’s focus on infrastructure development, fiscal reform, and improving the business climate are broadly the right areas of focus for addressing this situation. Ostensibly progress has been made. The key question is to what extent this has contributed to improving Indonesia’s growth trajectory. The centrepiece of the Jokowi administration’s pro-growth agenda has been a ‘big push’ infrastructure drive. Inadequate infrastructure is the most widely cited constraint to faster economic growth. Roads, ports, and airports are all heavily congested, power shortages are common, and access to modern water and sanitation systems is limited. High logistics costs have been particularly damaging given Indonesia’s archipelagic geography. A common refrain is it is cheaper for Jakarta to get its oranges from China than nearby Kalimantan. To deliver his infrastructure drive, Jokowi’s strategy has entailed increasing budgetary allocations (particularly by cutting energy subsidies), a heavy reliance on state-owned enterprises (including through capital injections and directly allocating major projects), and progressing previously stalled projects (in particular by expediting land acquisition). Despite various difficulties, sustained attention has seen a number of high-profile projects, notably in and around Jakarta, either completed or on track for completion. Of 247 national strategic projects, 26 have been completed while seven top priority projects are to be completed by 2019. A systematic way to consider how far this has gone in closing the infrastructure deficit is to examine the size of the total stock of infrastructure — that is, taking into account the accumulation of past investment while adjusting for the physical depreciation of these assets over time. Figure 8 shows estimates for the infrastructure stock and annual investment since 1995 based on data for realised investment in core infrastructure subsectors (energy, telecoms, transport, water and sanitation, and irrigation) financed by the government (central and subnational), state-owned enterprises (SOEs), and the private sector. These stock estimates suggest Jokowi’s progress so far has only arrested, rather than reversed, the deteriorating trajectory of the infrastructure deficit. The adequacy of the infrastructure stock-to-GDP ratio has fallen consistently since the Asian financial crisis, with investment failing to keep pace with physical depreciation and rising demand (measured by real GDP growth). Recent efforts have increased investment from about 3 per cent of GDP in 2014 to 4 per cent of GDP in 2016 (and likely slightly higher in 2017). However, ongoing economic growth means this has only been enough to stabilise the infrastructure stock-to-GDP ratio. Meaningfully closing the infrastructure deficit will therefore require a further substantial increase in investment. Note: The rise in the stock-to-GDP ratio for both measures in 1998 and 1999 reflects the sharp drop in GDP due to the Asian financial crisis, which more than offset a simultaneous decline in investment. Sources: Australia Indonesia Partnership for Economic Governance (a government-to-government technical cooperation facility) and the World Bank (for details, see “Box 4: Methodological Note on Estimating Infrastructure Capital Stock in Indonesia”, in World Bank, Indonesia Economic Quarterly: Continuing Adjustment, March 2013, https://openknowledge.worldbank.org/handle/10986/16614). Underlying data based on: Ministry of Finance, Ministry of State Owned Enterprises, Ministry of Public Works and Housing, IJGlobal database, and World Bank PPI database. One common concern is that Jokowi’s infrastructure drive has been occurring within a poor institutional framework including longstanding weaknesses in planning, budgeting, implementation, and operations and maintenance. In addition, a preference for speed and state-led development has also seen a heavy reliance on SOEs, including through the direct allocation of major projects rather than going to market. This leads some analysts to question the likely economic dividends from Jokowi’s infrastructure drive, arguing quality needs to be prioritised over quantity and speed. Similar institutional problems plague most emerging economies. Empirical studies nonetheless tend to conclude that the economic returns on infrastructure investment are still strongly positive even in the presence of such inefficiencies (although returns are of course lower than they could otherwise be). The reasoning is simple: with inadequate infrastructure to begin with, the returns to even relatively poorly managed investment can still be high. Concerns over inefficiencies notwithstanding, Indonesia’s principal challenge then is financing substantially higher infrastructure investment. To fund its infrastructure drive, the Jokowi administration has relied on a strategy of redirecting funds within the government budget, stepping up tax enforcement and allowing the fiscal deficit to widen. Despite some good achievements, fiscal reform has been uneven and all three elements of the existing strategy are reaching their limits. Jokowi’s most significant policy accomplishment has been to cut wasteful energy subsidies, which have long plagued the budget and crowded-out more important spending priorities. Aided by lower world oil prices, the total energy subsidy bill has shrunk from a fifth of the budget in 2014 to one-twentieth today. That has freed up sizeable funds for Jokowi’s infrastructure drive and also helped contain the fiscal deficit. However, finding additional savings will likely be more difficult. With the most obvious policy changes already largely in place, further progress will require more effective planning and budgeting. On the revenue side, the results have been much more limited. The initial strategy of coupling ambitious revenue collection targets with aggressive enforcement by the tax office proved counterproductive, damaging business sentiment and resulting in revenue shortfalls that eventually necessitated destabilising mid-year budget cuts. The government’s tax amnesty program (intended to induce tax evaders to declare hidden assets) has been more successful, with assets worth 40 per cent of GDP being identified. This has the potential to increase future tax collections, although capitalising on this will take time and remains contingent on a deeper modernisation of the tax system. The government to its credit has been focused on this. Yet, despite stepped-up efforts and the one-off boost from the tax amnesty, the tax-to-GDP ratio has now slid to just under 10 per cent of GDP — abysmally low for an emerging economy let alone a future global economic power. Meanwhile the fiscal deficit has been allowed to widen slightly and has been hovering at around 2.5 per cent of GDP for the past few years. Initial acceptance of a larger deficit was warranted to avoid putting further pressure on a slowing economy. Fiscal solvency is also not in doubt given low public debt. However, while the fiscal deficit is not excessively large, it is uncomfortably close to the 3 per cent of GDP legal limit seen as important to maintaining fiscal discipline and market confidence. The budget therefore has little space to manage potential negative shocks, including risks of revenue shortfalls, higher debt-servicing costs, or if stimulus was needed to support the economy. The current fiscal strategy is thus reaching its limits in terms of financing the higher development spending widely seen as required for Indonesia to improve its underlying growth trajectory. The overall result has been that total government development spending — on capital, education, health, and social assistance — remains low and has even fallen slightly relative to GDP since 2015 as weak revenue collection has forced the government to contain overall expenditure (Figure 9). Whereas the average emerging economy in Asia invests more than 14 per cent of its GDP on development, Indonesia still only invests about half that amount. The final key focus of Jokowi’s pro-growth agenda has been to dramatically improve Indonesia’s difficult business climate. This has been pursued through a series of reform packages aimed principally at cutting red tape and attracting FDI. As noted earlier, ostensibly there has been solid progress, as demonstrated by the jump in Indonesia’s Ease of Doing Business ranking. The extent of genuine change is less clear. Perhaps predictably, anecdotal evidence suggests that while formal processes have been streamlined, actual service delivery has been slow to improve (although administrative corruption has declined). A major limitation has been that implementation has been very uneven, both horizontally across different parts of the central government and vertically between the central and subnational government levels. At the national level, core business registration has been streamlined but bottlenecks remain in the many technical licences required by various line ministries such as trade, industry, and agriculture. Similarly, there is a disconnect between central government progress and patchy improvements at the local level where many licences are issued. With businesses unable to operate without a multitude of approvals across these sources, reform in any one area remains a necessary but insufficient condition to attracting new investment and generating stronger competitive forces. This points to a key shortcoming of Jokowi’s business climate reforms. To date they have principally concerned cutting red tape rather than facilitating greater market openness and effective competition, where the economic benefits are likely to be much higher. In particular, the Jokowi administration is yet to reverse the protectionist trajectory that characterised the latter years of the previous government. That period saw the introduction of protectionist laws governing mining, agriculture, trade, and industry, leading to numerous market interventions including a ban on raw mineral exports, divestiture requirements for foreign mining companies, tighter restrictions on imported food, and local content requirements for electronic products. The cumulative impact was significant: non-tariff measures (quotas, licensing, procedural requirements, etc) doubled to just under 13 000 and the share of import lines covered by such measures rose from 37 to 51 per cent. Figure 10 shows the number of protectionist and liberalising policy measures introduced and still in force since 2009 affecting Indonesia’s trade in goods. In 2014, Jokowi’s first year in power, a continued tendency towards further protectionism can be seen. This is followed by what appears to have been a policy shift. However, while more liberalising measures were introduced in 2016, these efforts have since dropped off, leaving the total net number of additional protectionist measures since 2009 still elevated. Trade protectionism thus appears to have plateaued but at a higher level than when Jokowi first took office. Note: Net cumulative protectionism refers to the cumulative number of protectionist measures less the cumulative number of liberalising measures. Liberalising reform has been limited in other areas. Despite the emphasis on attracting foreign investors, revisions to the foreign investment negative list have been marginally liberalising on net, with some areas opened up even as others have faced tightened restrictions. As a result, Indonesia’s score in the OECD FDI Restrictiveness Index has improved by a modest 6 per cent while it ranks as having the third most restrictive regime among the 68 countries assessed and still more restrictive overall than it was back in 2011. The response from foreign investors has consequently been positive but limited, with FDI inflows recovering from a low of 0.5 per cent of GDP in 2016 back to 2.3 per cent of GDP in 2017, but still just below the average 2.4 per cent of GDP seen from 2010 to 2015. Progress with labour market reform has followed a similar pattern of capping problems, rather than resolving them. In 2015, the government introduced a new formula for setting minimum wages, linking increases to the rate of economic growth and consumer price inflation. Despite some significant shortcomings, the new system has brought more certainty and restraint to the previously escalating problem of politicisation and excessively large wage increases. However, the government has yet to address other major problems with the labour code, notably high severance costs that deter employment formalisation. The preceding analysis suggests that, overall, Jokowi’s pro-growth efforts have been enough to stabilise a pre-existing negative trajectory, but not yet substantially reverse it. When Jokowi came to power he inherited a worsening infrastructure deficit, a rapidly deteriorating fiscal situation, and a business climate that remained difficult and increasingly protectionist. In all these areas, his government appears to have succeeded in steadying the situation and in some cases making important improvements. Economic growth has stabilised as a result. Superficially, that might suggest that continuing along the same path will eventually deliver a meaningful economic uplift. However, the policy reality is more complicated. In particular, Indonesia’s economy continues to be hemmed in by the necessary trade-off between pursuing growth and protecting stability as well as political realities limiting more impactful reform. Meanwhile, the global economic environment looks set to become more challenging. Continuing to increase infrastructure investment remains a central growth priority. With budget space limited, the government is looking to SOEs and public-private partnerships to make up the difference. There is some scope to finance higher infrastructure investment through this strategy, given the ongoing search for yield among global investors and with SOEs implicitly backed by the government’s investment grade credit rating. This strategy alone, however, will not solve Indonesia’s aggregate infrastructure financing problem. 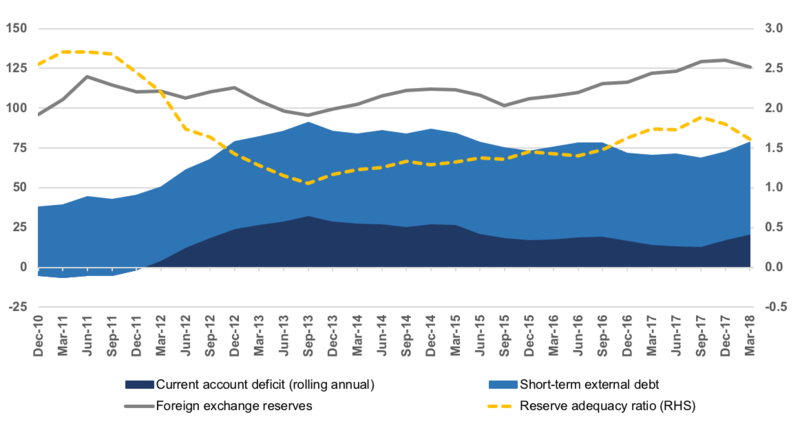 Indonesia not only faces a budget financing constraint but also an external financing constraint in its inability to sustainably run a large current account deficit. As the current account deficit fundamentally reflects total investment exceeding national savings, any major increase in infrastructure investment would likely mean a larger current account deficit regardless of whether it is financed by government, SOEs, or public-private partnerships. With the current account deficit around 2.3 per cent of GDP and rising, there is some headroom but not a lot, especially compared to the need for much higher infrastructure investment in the order of several percentage points of GDP. The trade-off between growth and stability therefore continues to bind Indonesia’s growth ambitions. Looking ahead, global financial conditions are also tightening as the US economy reaches full employment and US monetary policy normalises. Relying on external financing is thus becoming riskier and more expensive. How can Indonesia transcend this predicament? In the longer term, continuing to build its policy credibility and developing its domestic financial markets will make the trade-off less constraining. In the short-to-medium term, however, the main options available require significantly boosting the tax take, attracting more stable external financing flows, particularly FDI, and lifting Indonesia’s export competitiveness. Unlike at the time of the ‘taper tantrum’, Indonesia’s current account deficit today is entirely driven by its fiscal deficit — reflecting a classic ‘twin deficits’ problem. With the budget a source of negative net savings of about 2.5 per cent of GDP, the private sector must make up for this with positive net savings in order to keep the current account deficit in check. Private investment is effectively crowded out. Deeper tax reform is thus even more central than commonly thought. This is necessary not just to rein in the budget deficit and fund increased development spending. It is also needed to contain external financing pressures and, counter-intuitively, create more space for the private sector to respond to new growth opportunities with increased investment (without generating instability risks). The problem with the current tax reform strategy is that it has focused almost entirely on improving compliance while tax policy has largely been deferred. Low compliance and outright evasion are clearly an issue, yet progress is likely to be slow. More importantly, the current approach ignores clear gaps in existing tax policies which if addressed could deliver relatively quick and sizeable revenue gains. A recent report by the International Monetary Fund, for example, recommends frontloading a number of policy changes (notably removing numerous exemptions and raising value-added and property taxes) that would bring Indonesia more in line with international practices and could yield an additional 3 per cent of GDP in revenue by 2022. A common counterargument is that such proposals will simply increase the burden on existing taxpayers. However, this unnecessarily conflates two separate problems. If existing taxpayers face sub-optimal tax policies, then there is appropriate scope to pursue policy changes simultaneously with efforts to improve compliance. The real blockage is political. Tax reform would mean higher taxes on everyday consumption goods, adding to politically sensitive cost of living pressures, and forcing wealthier Indonesians to pay more by restructuring income and property taxes. Deeper business climate reform will be essential to attracting greater FDI, lifting export competitiveness, and boosting productivity growth. However, meaningful reform faces complex obstacles. So far, government efforts have focused predominantly on cutting red tape, an approach that is both generally popular and faces little opposition from vested interests. The real need, however, is dismantling anti-competitive market protections that run across the entire economy, impeding efficiency, fragmenting the domestic market, and limiting the kind of international integration that has facilitated the more rapid growth seen in many other Asian economies. While many reforms are needed, the most fundamental ones face entrenched blockages. At the central government level, the line ministries that control sectoral regulations continue to be an obstacle to reform. At the subnational level, efforts by the Jokowi administration to remove thousands of problematic local regulations have already been stymied by the Constitutional Court, which has rejected the central government’s authority to do so. Meanwhile, any attempt to increase openness to international trade and investment must overcome strong ideological preferences favouring protection, state intervention, and economic nationalism. At the same time, global protectionism is on the rise as the Trump administration pursues an aggressive trade policy aimed at reshaping existing arrangements. For Indonesia, this presents some challenges. The major economies involved in the current trade disputes — the United States, China, and the European Union — together account for about a third of Indonesia’s exports while another 40 per cent goes to Japan, ASEAN, and other heavily trade-exposed East Asian economies. Indonesia is indirectly exposed to escalating protectionism involving these economies, although less so than many others in the region as its economy is less trade dependent. Indonesia also risks being directly targeted by Washington — the United States is reviewing Indonesia’s eligibility for preferential market access under its generalised system of preferences and has longstanding concerns about weak intellectual property rights and restrictive investment and services rules. As global protectionism potentially escalates, Indonesia will need to resist such impulses. Pursuing regional trade agreements — including progressing negotiations for the Regional Comprehensive Economic Partnership and entering negotiations to join the Comprehensive and Progressive Agreement for Trans-Pacific Partnership — would provide one key strategic response. This would allow Indonesia to support the agenda of open markets internationally while also anchoring the reform discussion domestically around the need to deepen Indonesia’s economic partnerships at a time when the global policy environment is becoming more uncertain. As Indonesia enters election season, it faces an uncertain economic outlook. The current ‘new normal’ of 5 per cent growth a year is solid by comparison internationally but inadequate for Indonesia’s needs. The economy, however, continues to be hemmed in by the need to protect stability while its growth model has been unable to deliver the productivity gains required to achieve faster growth within this constraint. Diminishing investment returns and an expanding workforce that is increasingly underutilised means even the ‘new normal’ of slower growth will not last long in the absence of adequate reform. Jokowi’s pro-growth policy efforts have made progress. Infrastructure investment has picked up and is now keeping pace with demand. The fiscal deficit has been contained, quality of spending greatly improved, and the groundwork being laid to strengthen revenue performance. Substantial progress has been made in cutting red tape, albeit unevenly. Rising protectionism is now being contained and minimum wage increases are more restrained and predictable. These are all important accomplishments and particularly so when viewed from the perspective of the considerable political and institutional problems confronting any economic reform in Indonesia. Nevertheless, Jokowi’s efforts have so far only stabilised what was previously a worsening trajectory, rather than delivered a meaningful turnaround. Indonesia has many opportunities to realise much faster growth — from its dynamic e-commerce industry to its burgeoning market of middle-class consumers. Doing better, however, will require some recalibrating of the reform agenda. With the global economic environment set to become more difficult, economic policy will need to more than make up the difference. Infrastructure investment needs to be much higher but also complemented by deeper tax and business climate reforms. Doing so would make the trade-off between growth and stability less binding while generating the stronger productivity gains needed to make faster growth more sustainable. The author would like to thank all those who contributed their considerable insights and expertise to make this a better paper, including John Edwards, Stephen Grenville, David Nellor, Hal Hill, Dhruv Sharma, many friends and former colleagues based in Indonesia, and two anonymous referees. Thanks also to Lowy Institute colleagues Lydia Papandrea, Alex Oliver, Anthony Bubalo, and Erin Harris for their support in preparing the paper. All views and mistakes remain my own. IMF, World Economic Outlook, April 2018 database, https://www.imf.org/external/pubs/ft/weo/2018/01/weodata/index.aspx. Pricewaterhouse Coopers, “The Long View: How Will the Global Economic Order Change by 2050?”, February 2017, https://www.pwc.com/gx/en/world-2050/assets/pwc-world-in-2050-summary-report-feb-2017.pdf. Pricewaterhouse Coopers, for instance, projects Indonesia will be ninth largest by 2030. Ibid, 12. The ‘taper tantrum’ refers to the sharp rise in US treasury yields and related sell-off of emerging market assets sparked by comments by then US Federal Reserve Chairman Ben Bernanke about the prospect of eventually tapering the Fed’s bond purchases under its quantitative easing program. Indonesia was grouped in the so-called ‘Fragile Five’ economies — along with Brazil, India, South Africa, and Turkey — seen as most vulnerable to problems. See Chatib Basri, “India and Indonesia: Lessons Learned from the 2013 Taper Tantrum”, Bulletin of Indonesian Economic Studies 53, No 2 (2017), 137–160. International benchmark prices for these key commodities are down 35 per cent compared to their 2011 level on a net trade-weighted basis. From peak (February 2011) to trough (June 2015), the total fall was 76 per cent. This was achieved through monetary policy settings and imposing regulatory controls on corporate external debt, including requirements for currency hedging, liquidity maintenance, and credit worthiness. The system-wide capital adequacy ratio is over 20 per cent and regulatory stress tests indicate the financial industry remains robust to a sizeable shock, including a sharp depreciation of the rupiah to 20 000 to the dollar and rising interest rates: Maikel Jefriando, “UPDATE 1: Indonesia Financial Industry Able to Withstand Much Weaker Rupiah — Regulators”, Reuters, 30 April 2018, https://www.reuters.com/article/indonesia-rupiah/update-1-indonesia-financial-industry-able-to-withstand-much-weaker-rupiah-regulators-idUSL3N1S74DU. Foreign investors hold about 40 per cent of rupiah-denominated Indonesian government bonds and account for over half of all turnover on the Indonesian stock exchange. Indonesia’s foreign exchange reserves fell from about US$132 billion in January 2018 to about US$120 billion as at June 2018. Indonesia’s working-age population currently expands by about 2.3 million people each year: United Nations, Population Division statistics, https://esa.un.org/unpd/wpp/Download/Standard/Population/. In 2017, six Indonesian public companies made the Forbes Global 2000 list of top public companies: Bank Rakyat Indonesia, Bank Mandiri; Bank Central Asia; Telkom Indonesia; Bank Negara Indonesia; and Gudang Garam. By contrast, Malaysia and Thailand each had 14 companies in the list. UNCTAD, Country Fact Sheets, World Investment Report, 2017, http://unctad.org/en/Pages/DIAE/World%20Investment%20Report/Country-Fact-Sheets.aspx. Part of the explanation for Indonesia’s small overseas direct investment holdings may lie with the role of Singapore as an offshore financial centre, although this itself represents an important limitation of Indonesia’s global economic influence. World Bank, World Development Indicators database, https://data.worldbank.org/products/wdi. Ibid; WIPO, World Intellectual Property Organisation database, http://www.wipo.int/branddb/en/. Times Higher Education, World University Rankings 2018, https://www.timeshighereducation.com/world-university-rankings/2018/world-ranking#!/page/0/length/25/sort_by/rank/sort_order/asc/cols/stats. For example, Jakarta’s international airport has benefitted from the completion of a new modern terminal and rail link to the city and initial expansions to Tanjung Priok, Indonesia’s most important seaport, have been completed. The Jakarta Mass Rapid Transit project is expected to be operational in 2019 and a high-speed rail link to nearby Bandung by 2020. Meanwhile, across the country new toll roads, airports, power plants and other facilities are being constructed including the Trans-Java highway, which is already partly in operation. World Bank, Doing Business database, http://www.doingbusiness.org/data/exploreeconomies/indonesia. Anton Hermansyah, “Jokowi Questions Indonesia’s Slow Economic Growth”, The Jakarta Post, 6 January 2018, http://www.thejakartapost.com/news/2018/01/06/jokowi-questions-indonesias-slow-economic-growth.html. Construction accounts for about 75 per cent of total gross fixed capital formation according to the Indonesian national accounts: http://www.bi.go.id/sdds/. This includes investment in infrastructure; however, separate estimates reported later in this Analysis indicate this remains a small share. World Bank, World Development Indicators, https://data.worldbank.org/. According to data from the World Enterprise Survey, Indonesian firms report that 66 per cent of their investment is funded internally and 12.8 per cent is financed by banks: World Bank Group, Enterprise Surveys, “Indonesia 2015”, http://www.enterprisesurveys.org/data/exploreeconomies/2015/indonesia#finance. Only Vietnam exhibited a higher proportion at 100 per cent. Haryo Aswicahyono and Hal Hill, “Indonesian Industrialisation an Industrial Policy: Catching Up, Slowing Down, Muddling Through”, in The Indonesian Economy: Trade and Industrial Policies, Lili Yan Ing, Gordon Hanson and Sri Mulyani Indrawati eds (Oxon; New York: Routledge, 2018). Within sector labour productivity growth refers to productivity gains occurring within sectors (as opposed to productivity gains due to the movement of workers across sectors from low to higher productivity areas). Committee for Acceleration of Priority Infrastructure Delivery, KPPIP Report for January–June 2017, https://kppip.go.id/en/publication/kppip-semester-reports/; and KPPIP, Priority Projects, https://kppip.go.id/en/priority-projects/. Using an alternative measure from the IMF for the total stock of ‘public capital’ provides a similar picture. See, for example, David Ray and Lili Yan Ing, “Addressing Indonesia’s Infrastructure Deficit”, Bulletin of Indonesian Economic Studies 52, No 1 (2016), 1–25. Government capital injections into state-owned enterprises amounted to about 0.6 per cent of GDP over 2015 and 2016. See, for example, Waturu Suzuki, “Indonesia Lives Dangerously with $355bn Infrastructure Drive”, Nikkei Asian Review, 21 November 2017, https://asia.nikkei.com/Features/Asia-Insight/Indonesia-lives-dangerously-with-355bn-infrastructure-drive. IMF, Making Public Investment More Efficient, Staff Report, June 2015, http://www.imf.org/external/np/pp/eng/2015/061115.pdf. The government has, however, failed to follow its original plans for regular price adjustments. As oil prices have risen, the state-owned oil company Pertamina has had to shoulder the difference between the administrative and economic costs of certain fuels, creating an implicit off-balance sheet subsidy. The Economist, “Indonesia’s Tax Amnesty Passes Its Deadline”, 30 March 2017, https://www.economist.com/news/finance-and-economics/21719822-it-brought-windfall-has-been-criticised-letting-evaders. For example, although the government has now identified significant additional taxable assets, it still needs to develop the capability to take advantage of this data, in particular by adopting data-driven and risk-based systems to guide compliance efforts. For a broader discussion, see Natasha Hamilton-Hart and Gunther Schulze, “Taxing Times in Indonesia: The Challenge of Restoring Competitiveness and the Search for Fiscal Space”, Bulletin of Indonesian Economic Studies 52, No 3 (2016), 265–295. According to IMF data, the average revenue-to-GDP ratio for emerging and developing economies in Asia is 25 per cent, compared to an equivalent figure of 14 per cent of GDP for Indonesia: IMF, World Economic Outlook, April 2018 database, http://www.imf.org/external/pubs/ft/weo/2018/01/weodata/index.aspx. IMF, “Indonesia: Selected Issues”, IMF Country Report No 17/48, February 2017, https://www.imf.org/en/Publications/CR/Issues/2017/02/11/Indonesia-Selected-Issues-44654. According to research interviews by the author as well as similar anecdotal reports by various organisations including World Bank, Indonesia Economic Quarterly: Closing the Gap, October 2017, https://openknowledge.worldbank.org/handle/10986/29727, and Pulse Lab Jakarta, “Let’s Get Down to Business”, Pulse Stories, No 4, 2016, https://medium.com/pulse-lab-jakarta/pulse-stories-lets-get-down-to-business-878865028dea. The government itself recognises this problem with recent further efforts to improve coordination: “Indonesia Prepares ‘Ease of Doing Business’ Task Forces”, The Jakarta Post, 3 November 2017, http://www.thejakartapost.com/news/2017/11/03/indonesia-prepares-ease-of-doing-business-task-forces.html. Pulse Lab Jakarta, “Let’s Get Down to Business”. Jokowi himself has been openly highly critical of the lengthy process for issuing licences: Anton Hermansyah, “Jokowi Criticizes Regions for Lengthy Business Permit Issuance”, The Jakarta Post, 23 January 2018, http://www.thejakartapost.com/news/2018/01/23/jokowi-criticizes-regions-for-lengthy-business-permit-issuance.html. For an overview of licensing requirements, see N Nurridzki, “Pilot Study: Mapping and Streamlining Business Licenses at the National Level”, A Report for the Multi Donor Facility for Trade and Investment Climate, World Bank, August 2010. See Arianto Patunru and Sjamsu Rahardja, Trade Protectionism in Indonesia: Bad Times, Bad Policy, Lowy Institute Analysis (Sydney: Lowy Institute, 2015), https://www.lowyinstitute.org/publications/trade-protectionism-indonesia-bad-times-and-bad-policy. Stephen Marks, “Non-Tariff Regulations in Indonesia: Measurement of their Economic Impact”, Australia Indonesia Partnership for Economic Governance, Jakarta, 14 September 2015, http://research.pomona.edu/stephen-marks/files/2016/05/Analysis-of-NTMs-in-Indonesia.pdf. For the most part, protectionist measures have again taken the form of non-tariff barriers. Tariff-based protection has also risen, with the simple average applied import tariff rising from 7.0 per cent in 2014 to 8.3 per cent since 2016 based on figures from the World Integrated Trade Statistics database (https://wits.worldbank.org/) and updated by the World Bank Jakarta Office (http://www.worldbank.org/en/country/indonesia). A number of sectors have been opened to greater foreign involvement, notably in service industries including e-commerce, cold storage, and telecommunications. This has also been the main liberalising reform for trade in services, which has otherwise been affected by tightening restrictions on foreign workers. At the same time, however, more restrictive FDI rules were introduced in other sectors, particularly in public works. Particular issues with the new formula for setting minimum wages include that it is not tied to worker productivity and does not take into account varying sector and local market conditions. Minimum wage increases have significantly outpaced average wage growth and now stand at over 80 per cent of average wages. Yet compliance is also low. See Emma Allen, “Analysis of Trends and Challenges in the Indonesian Labour Market”, ADB Papers on Indonesia No 16, March 2016, https://www.adb.org/sites/default/files/publication/182935/ino-paper-16-2016.pdf. Current account deficit measured on a four-quarter rolling sum basis. Roland Rajah, “Indonesia: ‘Twin Deficits’ Still a Brake on High Growth Ambitions”, The Interpreter, 8 August 2017, https://www.lowyinstitute.org/the-interpreter/indonesia-twin-deficits-still-brake-high-growth-ambitions. Tobacco excise taxes have been reformed, including by raising excise tariffs (although there remains scope to raise this further). However, other tax policy changes have gone in the opposite direction, including raising the tax-free threshold for personal income tax and offering various tax incentives (e.g. removing VAT in the transport sector to reduce logistics costs, increasing the threshold of luxury apartments tax, and reducing tax for real estate trusts and personal income tax in labour-intensive industries). IMF, “Indonesia: Staff Report for the 2017 Article IV Consultation”, IMF Country Report No 18/32, February 2018, https://www.imf.org/en/Publications/CR/Issues/2018/02/06/Indonesia-2017-Article-IV-Consultation-Press-Release-Staff-Report-and-Statement-by-the-45614. For details on recommended IMF tax reforms, see IMF, “Indonesia: Selected Issues”, IMF Country Report No 17/48. For a comprehensive review of the issues, see OECD, OECD Reviews of Regulatory Reform: Indonesia 2012. Carlos Paath, “Constitutional Court Takes Away Home Affairs Ministry’s Power to Revoke Local Regulations”, Jakarta Globe, 6 April 2017, http://jakartaglobe.id/news/constitutional-court-takes-away-home-affairs-ministrys-power-revoke-local-regulations/.